If you don't know by now that the Makeup Show Atlanta Pop-Up Shop is this weekend then i'm not doing my job! I'm so excited for this show and especially for my panel during the show on Saturday June 18th at 5pm. I've partnered with my girls Mimi Johnson from The Glamatory and Ebony Miller from Industry Makeup Academy. I decided to this panel because I know that Atlanta is a thriving beauty market, and we need to come together as brothers and sisters in beauty, so that we can help everyone succeed and find their own niche. My dream is to have Atlanta have a collaborative beauty industry with tons of educational and networking opportunities for everyone to experience. This will not only lift up the level of talent, but also bring more opportunities and ensure that we're all making the money that we deserve. No more undercutting other artists or selfishness in not wanting to help others - rather we're going to all build each other up for the better. In this panel, we all have succeeded in different arenas of the beauty industry. We're going to keep it real and tell you how we succeeded and why you may not be successful in makeup today. This is an open forum to learn everything you can to make yourself a better Makeup Artist and Beauty Professional. These opportunities don't come very day so I hope that you all take advantage of it. Don't forget to purchase your advanced tickets by Thursday 6/16/16 at www.themakeupshow.com . 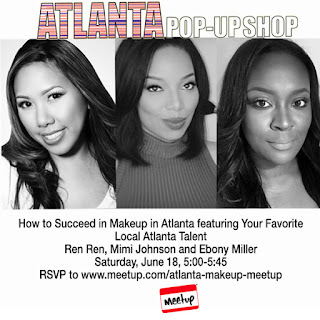 If you RSVP at www.meetup.com/atlanta-makeup-meetup you can purchase the student ticket rate and the first 30 people to check in at the show with their RSVP will receive a free makeup gift. If you repost this picture on instagram, you're eligible to win a complimentary ticket!